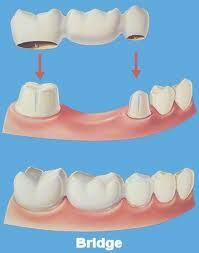 A bridge treatment is a long-term solution to replace missing teeth. A bridge spans the space where one or more teeth have been lost. The teeth on either end of the span are crowned and a false tooth joins the two ends together. Both aesthetics and function are considered when selecting the material most suitable for each individual case.